DIARY OF A PUBLIC SCHOOL TEACHER! 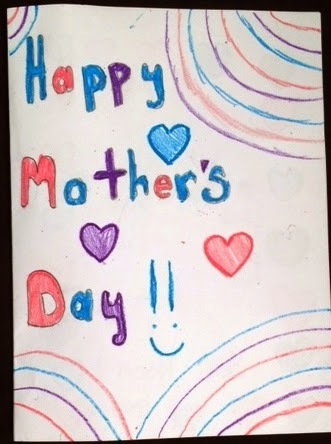 : A "QR Code" Mother's Day Card:Combining Tech + Traditional! 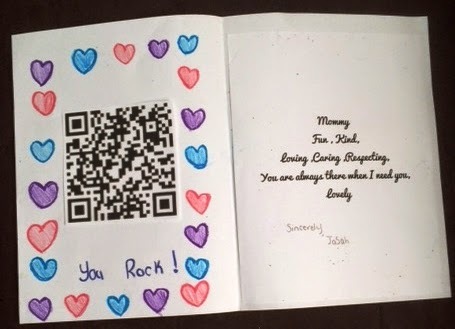 A "QR Code" Mother's Day Card:Combining Tech + Traditional! My class and I decided to mix poetry,(April is National Poetry Month),and tech when we made a card for the school secretary. I suggested that this would also be a great idea to use with a Mother's Day card. 2nd OR 3rd page - depending on student choice - Students typed the poem using the given format. The students glued a copy of the poem they wrote for their Mom on the page. Most of the students chose the cinquain format. Short, BUT, very, very, sweet.I wish I had a color printer, (Hmmm....Donor's Choose? ), or a color copier. The poem still looked good printed in black and white. 2nd OR 3rd page -The QR code. 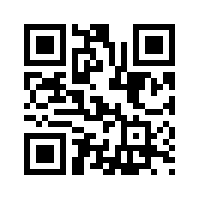 The QR code is a presentation of the poem. It could be presented as a recorded video. (Which will be uploaded to our Youtube channel.) 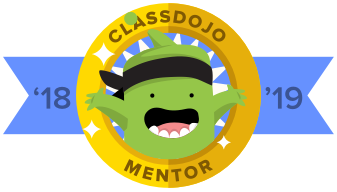 It could also be a Voki,(If the device does not have Flash, it will not display), or a Tellagami, it's the student's choice. Unfortunately, the secretary didn't have a Smartphone, but my kids' Moms do. This was a great stress reliever after testing! Students really enjoyed making the cards!